Nest #20 Whaling Station Bay is on lovely lovely spot, on a high cliff overlooking a rocky beach point, with a sandy bay on either side. In the winter it is a quiet spot, but in the summer the houses & beaches are packed with people. 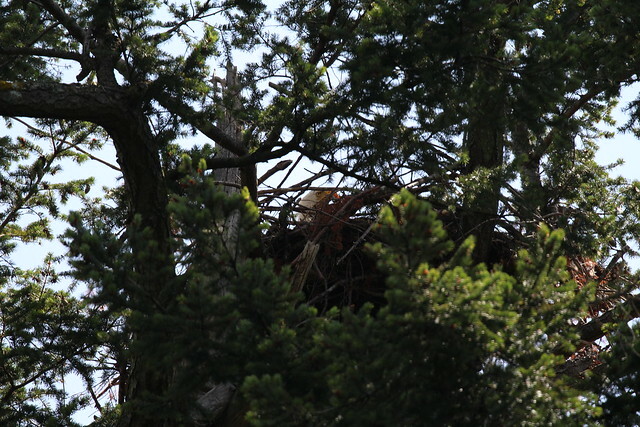 Last year there were two Eaglets in this Nest, & we were lucky that the people whose property the Tree is on came up just in time to find one of them standing on their deck! That story & many others about this Nest & the other residents of this territory can be found here. It was a lovely warm sunny fall day so we went for a walk along sandy Whaling Station Bay. The Eagles were calling & calling from the Nest #20 & 21 territories. There were a few of those lovely red Lion*s Mane Jellyfish, a big one & some smaller ones. There were tiny clear ridged thin ones everywhere in the sand. They were ridged from the center out. Then there were these cool ones! i*ve never seen them with the purple before. Booni, thanks for the photo. 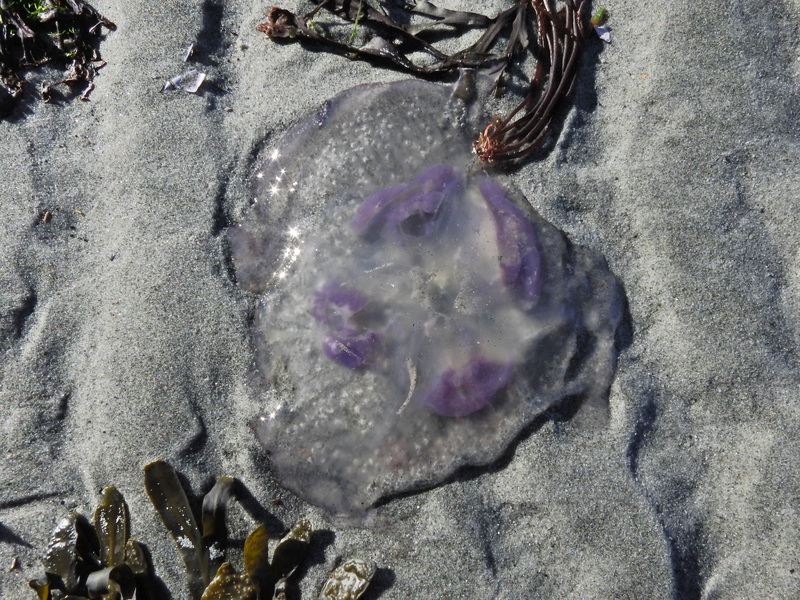 Today, paddling back into Whaling Station Bay, I saw two jellies that were unlike any I had ever seen. One was like this one you photographed. The other was like a transparent Moon Jelly, but really big, at least 20 cm across. I didn't get a chance to get photos and I'm grateful you did. Your powers of observation and ability to make it clear to those not able to be there always amaze and delight. Thanks again. According to the divers at Hornby Island Diving, those Jellies are a type of Moon Jelly(Aurelia aurita) which they haven*t seen here before. She found pictures of them here! Jellies are so interesting to watch! With kind permission from the neighbours, I spent a while watching this nest yesterday. This is a tricky nest to see! When I arrived there seemed to be a food delivery to the nest. A few minutes later I found a spot from which I could see the adult eagle. I spent a while watching but there were human visitors and my attention was split between birds and humans, so I missed most of the several sightings of sundry eaglet body parts. Definitely one little screeper in there and possibly two. I'm thinking this because later on, a few minutes after the adult had flown off, a second adult (i think) came in with a fish. Missed the photo but I could see something of good size held with both feet. Then I could see feeding motions and hear a little squeeing at the same time, so I'm wondering if there was a second eaglet complaining while waiting for his turn? No way to be sure for now. 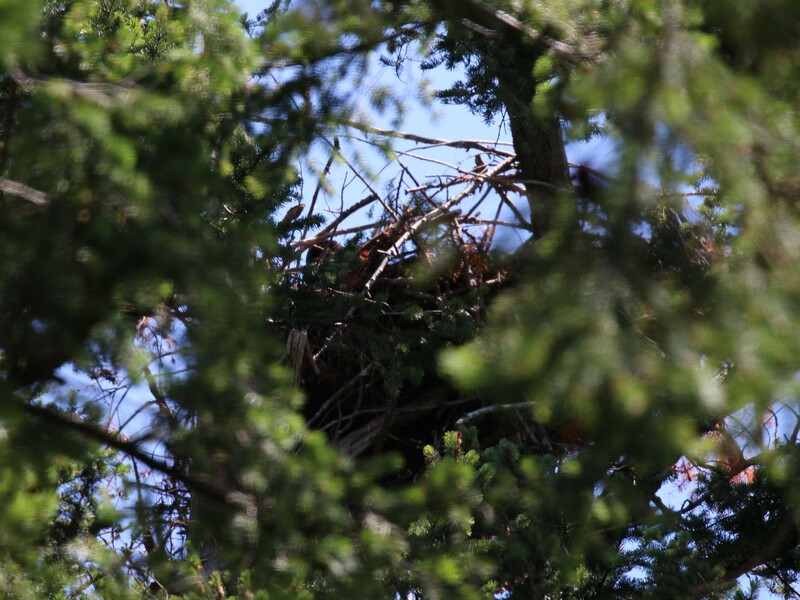 Here is the best photographic evidence I have of one eaglet, anyway. Just an outline of a brown head to the left. A neighbour of this nest told me something about eagle behaviour, something I had been curious about. From her yard, she can see this pair's sleeping tree! I asked her where the fledglings sleep after they leave the nest. She said the adults settle in their sleeping tree at about 8 pm in early August. Sometimes, shortly after that, a fledgling comes clumsily flying along, thrashing among the trees. He or she tries to go share the parents' night-time perch, but they don't let that happen. The fledgling usually settles in a neighbouring tree, but is not allowed in the parents' sleeping tree. i have heard this same behaviour described by neighbours who live near that perch Tree on the other side of the road!